Walk-In or Space Saving. Display your wardrobe, or hide your clutter. No matter what you’re looking for in a closet, SoCal Carpentry is the San Diego Custom Closet Builder that you need. SoCal Carpentry specializes in high-end furnishings, millwork, and finish carpentry. If you have a dream for your space, we can make it come true. Contact SoCal Carpentry For Your Free Estimate Today. 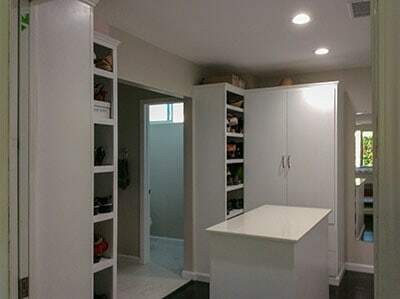 Custom Closets Designed & Built to Your Specs in San Diego. A custom closet can make a huge improvement in your day to day life. Couples constantly argue about closet space, you waste time each day trying to find that jacket or pair of shoes that are at the bottom of a pile of clean clothes and you lack organization. Don’t continue to live with your basic closet and have SoCal Carpentry install a closet that meets all of your needs. SoCal Carpentry provides woodworking and carpentry work to San Diego and surrounding areas, including creating custom cabinets with every feature that you can dream up. By maximizing the potential of your closet, with a personalized closet design that is tailored to your exact desires and needs, style and budget, creating exceptional storage and organization that will improve your day to day life. Learn more about SoCal Carpentry Custom Carpentry, Finishing, Furniture, and Trim. 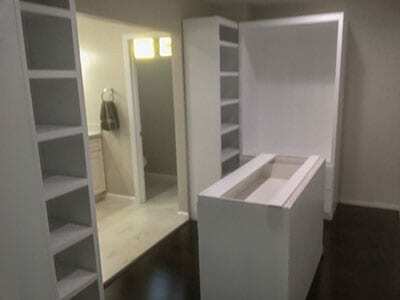 San Diego Custom Closets by SoCal Carpentry. A custom storage solution for your walk-in closet increases usable space, taking advantage of every inch of extra space while showcasing your own personal style. Custom Closets allow you to increase the use of small spaces and make adjustments based on your evolving needs. A sophisticated and functional custom closet system can be placed wherever you need it, behind closed doors or beautifully displayed in your residence. Add lighting to your custom closet, illuminating and displaying the pieces that you love so much, you will love showing off your custom closet from SoCal Carpentry. Specialized racks to allow you to hang all of your clothes, keeping them off of the ground and perfectly organized. Jewlery displays and shoe racks are a great addition to your custom closet. Lock away your valuable jewlery in a beautiful display making the perfect accessory easy to find. Are you a shoe collector? Keep your shoes clean and ready to find with a custom closet solution from SoCal Carpentry. Can You Custom Build A Walk In Closet? Absolutely! SoCal Carpentry is a fully custom Design & Build custom carpentry, cabinet maker, and fine wood working shop. We specialize in one-off custom designs that are built to your exact specifications. 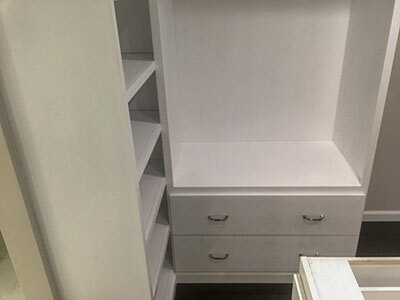 So if you’re looking for a large walk-in closet, SoCal Carpentry is the perfect choice for your San Diego Custom Closet. 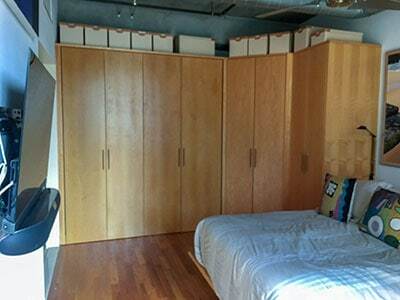 Are these closets built with big box store closet kits? No, While we do offer budget-friendly options, we believe in only providing our clients with the highest quality materials. When we agree to a job we plan the job from start to finish using only the finest materials built to your specifications. What is the build process for a Custom Closet? Our Custom Closets are built using the same process as all of our projects. We begin with a free consultation to get the scope of the project, we use CAD to design the project, build the timeline, and provide an estimate for the project. We then build and install your piece to your exact specifications. Want to find out more? Take a Look.